Raleigh, NC – November 14, 2014 – SportsTravel magazine today presented its ‘Best New Sporting Event’ Award for 2014 to the Rock ‘n’ Roll Raleigh Marathon & ½ Marathon presented by WRAL benefiting The V Foundation. The magazine announced the winners today in Las Vegas at their annual TEAMS conference (Travel, Events and Management in Sports) which is the world’s largest gathering of event organizers and travel planners from the sports industry. One of the industry’s most prestigious awards, the SportsTravel Awards annually honor excellence in sporting event production and management at the amateur, collegiate and professional levels. To be eligible, events had to occur between July 1, 2013, and June 30, 2014. Criteria for nomination and voting included superior organization of and attendance at the event; the event provided a superior experience for competitors and spectators, and the event’s host city or venue served to enhance the event. The award was given “in recognition of exceptional excellence in sporting-event production” and Rock ‘n’ Roll Raleigh is the first event in the 17-year history of the Rock ‘n’ Roll Marathon Series to be honored. The 2015 Rock ‘n’ Roll Raleigh Marathon & ½ Marathon will once again start on South Salisbury Street in downtown Raleigh. Participants will again experience sights like the Governor’s Mansion, Rose Garden, and Historic Oakwood neighborhood. The route runs through Meredith College and North Carolina State, before finishing in downtown Raleigh on Fayetteville Street near the Red Hat Amphitheater where runners can gather with friends and family for the post-race concert. The race benefits The V Foundation for Cancer Research, founded by the late Jim Valvano, legendary North Carolina State basketball coach and ESPN commentator. Since 1993, The Foundation has funded more than $115 million in cancer research grants nationwide and Team V efforts raised more than $300,000 at the inaugural event in April. Runners can join the cause by running for Team V at www.run4v.org. Marathon weekend will begin with a free two-day Health & Fitness Expo at the Raleigh Convention Center where all participants go to pick up their race number. The expo will feature dozens of running and fitness retailers, exhibits with free nutritional samples and a series of interactive clinics with running experts and pro athletes. 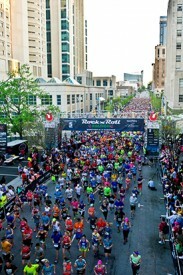 For more information about Rock ‘n’ Roll Raleigh or to register for the race, please visit RunRocknRoll.com/Raleigh. The second Rock ‘n’ Roll Raleigh Marathon & ½ Marathon presented by WRAL benefiting The V Foundation will take place on the weekend of April 10-12, 2015. Open to runners and walkers from novice to professional, live bands and local high school cheerleaders entertain and cheer on participants at every mile along the scenic course. A two-day Health & Fitness Expo kicks off race week at the Raleigh Convention Center on Friday, April 10 and Saturday, April 11. All participants must visit the expo to pick up their race numbers and browse over 100 vendors from the running and fitness industry. Race weekend concludes with a finish line festival and post-race concert at the Red Hat Amphitheater. To register for the race or for more information about Rock ‘n’ Roll Raleigh, visit RunRocknRoll.com/Raleighor follow @RunRocknRoll on Twitter.